RebelBetting - review by Blogabet. Established in 2007 in Umea, a town in North Sweden as Clarobet, RebelBetting has grown into one of the top services for arbitrage betting with users in over 120 countries. RebelBetting is not a bookmaker, but rather compares the odds of multiple bookmakers over multiple sports, events and markets to identify opportunities for arbitrage bets or surebets. It also enables customers to view all information and place all their bets within a single betting browser. What makes RebelBetting unique is its ease of use. Firstly, the software is made to be very intuitive. It has multiple features, allowing you to control your arbs, but unlike many competitors - here it is not confusing. Unlike most services, RebelBetting is a downloadable software program to run on your computer. Upon subscription, they send a detailed e-book that will help you get started with the program, but also with arbing. Moreover, RebelBetting have automated everything. After you select the arbitrage opportunity you wish to follow, you click on the “Bet” button and you get logged automatically into the bookmakers and the particular odds are highlighted for you to directly bet on. This means that even beginners that could get confused which market to select are covered here. Furthermore, this entire process happens in a single Betting Browser. No need to switch between browsers and windows. You can see two or three bookmakers websites in a single page with the overview of your desired arbitrage next to them. At a single glance you are able to get the full picture and place bets in an instant. Of course, you can always switch any of those to a full screen if it gets too crowded for you, but this option makes it so much easier and faster. If you have never used an arbitrage alert service before, that’s fine. This one is so easy that even newbies will handle it. 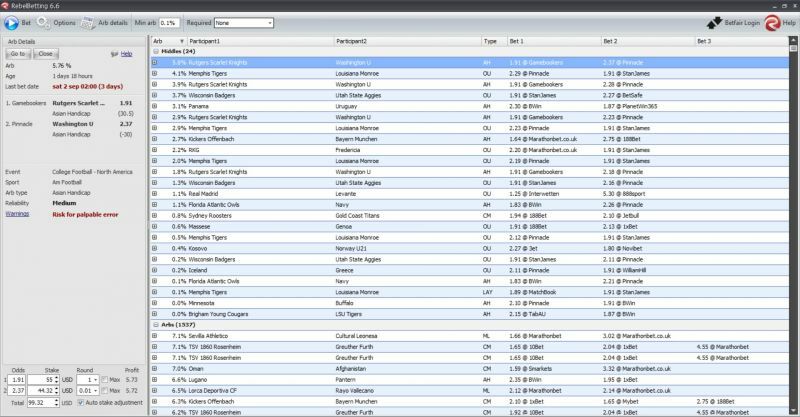 The dashboard shows you the existing arb opportunities or ‘surebets’ for pre-game sporting events. Clicking on the plus next to one, will help you explore the details. The panel on the left opens, showing the bookmakers and a neat arbitrage calculator. 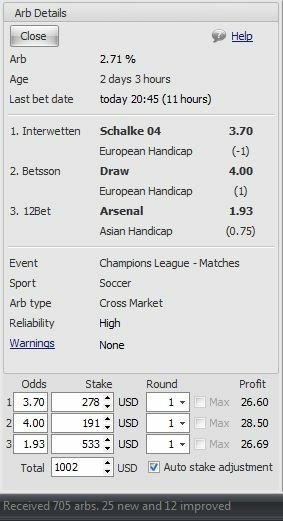 You can use it to play around and see the size of bets you need to place on each of the bookmakers within the arbitrage. RebelBetting is a company based in Sweden. It has been long enough on the market to establish its name as one that can be trusted. Their software is top-notch technology, offering security way above the industry norm. Requiring a master password, the program cannot be started by other users, unless you have set it to be remembered, in which case it is still encrypted bound to your user account and computer. All bookmaker logins and passwords are encrypted on your machine and all browsing happens through your computer and your browser. No information is ever sent to RebelBetting. RebelBetting currently has almost 80 bookmakers and keeps adding new ones. The number one bookmaker you need to have an account with is Pinnacle. They are arbitrage-friendly, they never limit players or close accounts. In case you still haven’t opened an account with them, you can do so HERE. Apart from Pinnacle, RebelBetting has bet365, 188bet, SBObet, Betfair, 10bet, Marathonbet, William Hill and many many more. By going to Options, you can filter the bookmakers you wish to bet with. The more you have, the more arb opportunities will be available. So you might want to open a few accounts before you get started. Make sure you claim your bonuses, if you are opening new accounts. Here, you can see a list of the current bonuses. Next to each bookmaker there are two checkboxes - E and R. E (for enabled) will show you arbs from this bookmaker. R (for required) will only show arbs with at least one of the required bookmakers. If you don’t click on one of the two checkboxes, the bookmaker will be disabled. 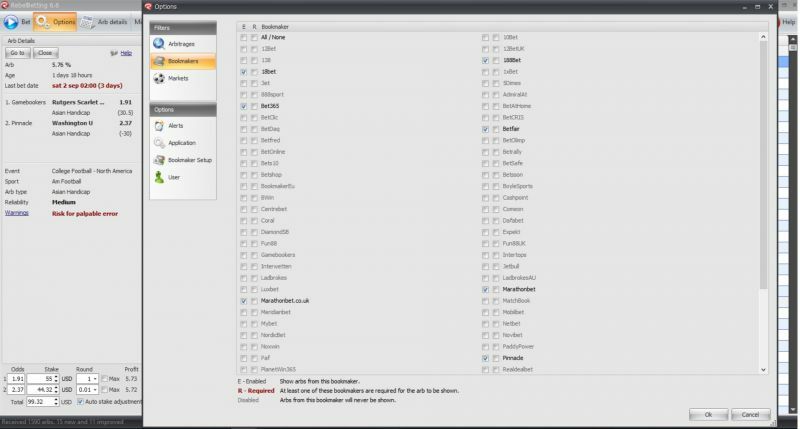 You can check and uncheck which ones you wish to be displayed. Once you have selected the bookmakers and markets, you have to set the minimum arb %. A good place to start would be 1-1.5%. Starting at a higher % can show too few arbitrage opportunities, particularly if you don't have many bookmaker accounts. The dashboard will display you the current existing options. By clicking on the plus, some details expand. You can see information on the event and sport, arb % and age (time that it has existed). Warnings are potential pitfalls that RebelBetting indicate are possible. For instance, palpable error is a warning that you might see. It means that there is a risk that a bookmaker might cancel your bet. While this is very rare, it might be a notable risk with certain bookmakers. So, it is great from RebelBetting to display it. You are also shown alternative opportunities to take the arbitrage and the calculator that enables you to play with the stakes. Once you have found the surebet you want to play, you just click on the blue “Bet” button. You will be taken straight to the Betting browser. Unlike most services where you waste valuable time finding the game and line before the arb opportunity has expired, here you have it all in one browser. The AutoLogin and AutoSurf take you straight to the bookmakers that participate in the surebet, log you in and highlight the odds you have to take. With the handle calculator on the left you can play with the stakes and see what happens. Once you know your stakes, you just place the bets and you’re ready. As arbitrage opportunities exist within short time frames, having alerts is a great feature. 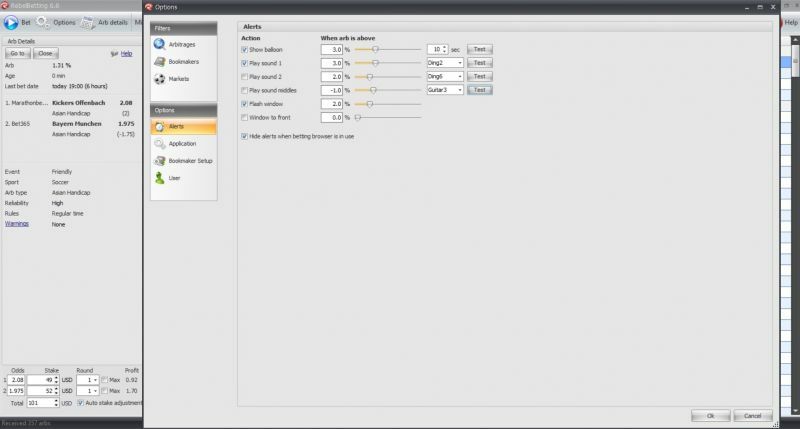 You can select between audio, visual alerts or just have RebelBetting pop up when a certain arb is found. Handy. With RebelBetting you get not only the software, but also a free e-book on Sports Arbitrage Trading to get you started. An excel spreadsheet to log your trades is also up their sleeve. Their website has a number of resources and a very well structured FAQ section. If you still need support, you can always use the live chat. As of April 2018 RebelBetting has launched Lite version of their software. It is a good option for newbies in arbitrage betting and users who have bankroll lower than 1500€. So if you are just getting started with arbitrage betting and want to explore this market before investing all of your bankroll, this would be a great option. With RebelBetting Lite you will receive all arbitrage opportunities which existed for more than 30 minutes and still exist. This means that they are stable and you can expect to make 10-20% profit per month. With RebelBetting Lite you will also receive full arbitrage boot camp e-book to help you get started, quick and easy betting process and fully customizable alerts. You can get RebelBetting Lite version for 39€ per month which is significantly lower price than the pro version. After a few month when you increase your bankroll and see for yourself how the software works you can upgrade to the pro version. 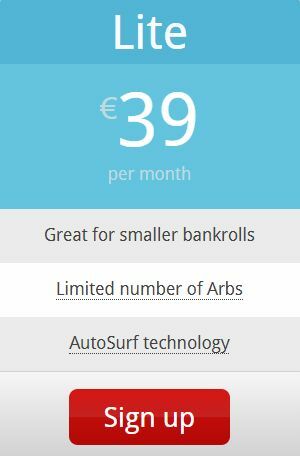 RebelBetting have set 4 different subscription plans with price as low as 69EUR/month. Considering that you can easily make a minimum of 10% profit every month, having a bankroll of 690 EUR makes this software a worthwhile investment. Of course, before dedicating to a year of service you need to try it out. That’s why they’ve set the trial week subscription. This trial week will provide you with first-hand experience and will very likely cover for the extension to the service. Fantastic, isn’t it? Give it a try today! The software does exactly what it says, and it works!